What Else Can I Expect From an Online Master's in Reading Literacy Program? Master's in reading literacy programs provide teachers with the knowledge and skills they need to help improve students' reading comprehension and language acquisition abilities. Many online reading master's programs feature courses that focus on research and curriculum development, but specific program details vary depending on the school and program a learner chooses. WHAT IS A MASTER'S IN READING AND LITERACY? A master's in reading and literacy provides teachers with the skills needed to help improve students' reading comprehension and language acquisition abilities. Read more here.. Many students who enter this program are current teachers. Graduates are prepared to work in education at the elementary and secondary levels as teachers, reading specialists, literacy coaches, and TESOL teachers. Read more here.. According to PayScale, in 2017, reading specialist earned between $34,592 and $73,641. Read more here..
Students earning their master's in reading and literacy who want to become reading specialists should enter a program that focuses on reading specialist work or make sure that their school offers a concentration in this area. Read more here..
Reading interventionists are reading specialists who provide intensive instruction to struggling students inside or outside of the classroom. Read more here..
University of South Florida is a public research institution that has many online learning opportunities. The school's reading specialist online program is offered as an MA in reading K-12. Learners who already hold a professional teaching certificate or a certification degree from a state-approved program are encouraged to apply to this two-year program. The degree is taught in three blocks, and each block ends with a transition point project to ensure distance learners have a firm grasp on the concepts. By the time students have moved through all three blocks, they’ll have completed between 33 and 36 credit hours, including a practicum in reading that's designed to provide them the opportunity to gain real-world experience. Degree-seekers can complete these experiences at an approved school near their place of residence. The program focuses on ensuring that every student has their needs met, even if they speak English as a second language. Courses related to this goal include teaching limited English proficiency students, trends in literature in a diverse society, and history and models of reading: prevention and intervention in reading difficulties. Regardless of whether or not they plan to work in Florida, all students must pass the Florida teacher certification examinations to graduate. The College of Education offers a range of scholarships to its online students. Current scholarships include the Velma Pate Thomas Scholarship (applicants must be full-time female students), the SEARLS/PFOST Scholarship (applicants must hold a 3.0 GPA and have completed 12 credits), and the Craig L. Johnson Endowed Memorial Scholarship (applicants must demonstrate a long-term commitment to education). Organized through its online learning department, the University of Georgia offers an online master’s in reading education that teaches students how to help pre-K-12 learners increase their reading and comprehension skills. This program, which is overseen by the university's college of education and the language and literacy education department, consists of 36 credit hours that are taught in a 12-course sequence. The curriculum incorporates the latest methodologies in literacy education. Courses include integrating digital resources in the literacy classroom, the history of teaching methods for literacy learning in the United states, and assessing literacy materials and programs. This program is for licensed teachers already working with students in PreK-12th grade classrooms who want to expand their knowledge to provide reading comprehension classes. Distance learners can expect to graduate within two years. Students are required to complete a capstone course and a final examination to qualify for graduation. As of 2017, the program is accredited by the National Council for Accreditation of Teacher Education and the Council for the Accreditation of Educator Preparation. Distance learners entering during the 2017-2018 academic year can expect to pay $26,550 for the entire program. Scholarships and grants are available for students within the college of education. UGA maintains a favorable transfer policy for students who have taken other online master’s in reading courses. Degree-seekers may transfer up to nine credits. Admission requirements include GRE or MAT scores, a minimum undergraduate GPA of 3.0, at least two years of teaching experience, and a current teaching license. TAMU boasts more than 250 graduate and professional programs. The university offers both a master of science and master of education in curriculum and instruction with an emphasis in reading and literacy. The M.Ed program requires 36 credits while the MS program requires 32 credits. Much of the curricula for the two programs is the same, but MS students complete an eight-hour research course, while M.Ed students take more courses in reading, writing, and instruction. 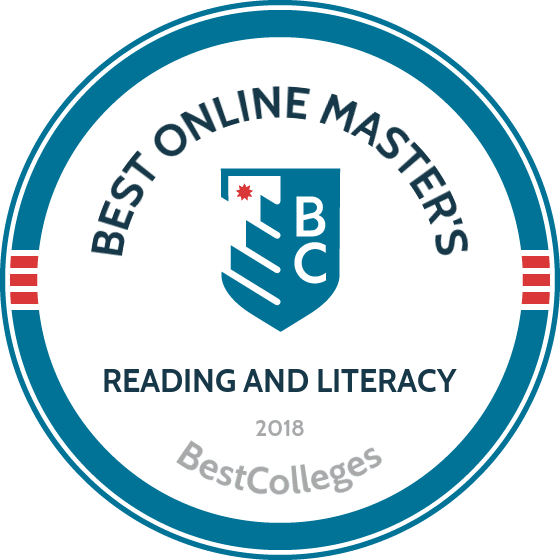 Students in the online reading master's programs have the opportunity to seek reading specialist certification and a master reading teacher certification. The reading specialist certification requires seven courses and the master reading teacher certification requires four courses. Students can choose to pursue both certifications with their master’s degree, but should indicate their interest in pursuing the certification when they apply to the program. Online courses are delivered asynchronously. The help desk is available 24 hours day to help students with technical issues. TAMU provides graduate advising for all students, and the Byrne Student Success Center offers assistance with tutoring, campus resources, and academic counseling. Distance learners also gain access to library resources, including remote information sessions. Graduate students may be eligible for financial aid, including scholarships, assistantships, grants, and loans. Applicants to the master’s programs must apply by March 1st. Prospective students should submit an application, transcripts, two essays, and three letters of recommendation. The university recommends a minimum GPA of 2.75 to be admitted. The GRE is not required. To complete the certification programs, students must hold a valid Texas teaching certificate, pass a state exam, and have either two or three years of teaching experience. The graduate school of education at UB has been conferring online degrees for over 15 years. Today, the school offers more than 10 online master’s programs, including the Ed.M in literacy education studies. The 30-credit online reading specialist program consists of 27 credits of required courses and one elective. Required courses cover topics such as digital technology and literacy, children’s literature, and reading and language. Students complete a capstone experience, which is either a project or a comprehensive exam. Full-time students can complete the program in two to three semesters while part-time students can finish in four to five semesters. This degree does not lead to teaching certification in New York state. However, graduates of the program can work as reading specialists, ESL teachers, adult literacy coaches, and educators in situations that do not require certification. Online programs are delivered asynchronously through UBlearns, the university’s learning platform. Small classes provide students with individual attention. Online courses follow the university calendar: 15-week terms in fall and spring and 6- to 12-week courses in the summer. Graduates of online programs are invited to attend commencement ceremonies on-campus and can take advantage of UB alumni association networking and professional development resources. Program applicants must submit all transcripts and two letters of recommendation, with one letter focusing on the applicant’s academic abilities and one letter about their professional or teaching abilities. Prospective students should complete their application by February 1 for fall and November 1 for spring. However, space in the program is limited and the school encourages students to apply early. Out-of-state students save 40% on their tuition by enrolling online, and financial aid is available for eligible students. Students who complete the online master’s program may also be interested in UB’s online Ph.D in curriculum, instruction, and the science of learning. The College of Education at East Carolina University is home to a modern, forward-focused master's in reading online for graduates seeking educational roles related to literacy and reading leadership. This online-only program prepares graduates for a range of professional opportunities, including careers in literacy and reading leadership in K-12 public or private schools. The 39-semester hour MAEd in Reading Education degree program offers the opportunity for advanced study in literacy education and leadership. Candidates explore current reading research, assessment and diagnosis of reading difficulties, management and oversight of literacy programs, and develop action research projects related to an area of interest. Nine hours of study are selected from a variety of literacy related courses, including library science, gifted education, digital literacy/technology integration, community college instruction, and teaching English as a second language. Students complete a professional portfolio and presentation to qualify for graduation. The degree program may be completed on a part-time or full-time basis and all courses are online. Most students graduate within two to three years, even while teaching full-time. An initial teaching license is required to apply and some individuals may need to take prerequisite courses in reading methods in order to be accepted to the program. Upon completion of the program, graduates with valid NC initial licensure are eligible for advanced licensure as a K-12 reading specialist (students outside of NC should check with local officials to ensure equivalent qualification). Faculty members have contributed research in areas of literacy, literacy teacher preparation, best teaching practices, and the use of technology. Applicants may enroll at four different times during the academic year: fall, spring, first summer session, and second summer session. Deadlines are August 1, December 1, April 20, and June 15. SUNY’s University at Albany is a public research institution that’s been providing education for more than 170 years. The university’s department of literacy teaching and learning offers two types of online master’s in reading: a master of science in literacy and a master of science in special education and literacy. The MS in literacy offers three additional certifications in birth through sixth grade, fifth grade to 12th grade, and birth through 12th grade. This program underwent a complete revision in 2013, and the current curriculum relies on the latest in research, policies, and technology to help prepare teachers for roles as literacy specialists, coaches, or advanced classroom teachers. Students can attend the program in a part-time or full-time format, and classes are offered asynchronously. The second option, the MS in special education and literacy, is a 43-credit program that provides initial professional certification in working with students with disabilities, grades one through six. This program is only available full-time, but courses are taught asynchronously so teachers can fit coursework into their busy schedules. Students have a number of different practicum areas to select from, including adolescent literacies, preventing literacy difficulties, and differentiated instruction/coaching. Core courses include adolescent literacies and modalities; data-based decision making in literacy assessment, policy, and practice; and classroom literacy instruction. Four different practicums are required in the areas of writing in the classroom and differentiated institution and coaching. Each of these paths leads to full certification in New York, but students living outside this region should check with their board of education before committing to the program. As of the 2016-2017 academic year, graduate students paid tuition fees of $453 per credit (this price reduces as students sign on for more credits). The M.S.Ed. in literacy, culture, and language education is one of over 100 academic programs offered online through IU. The 36-credit program includes 15 major credits, six foundation credits, and 15 elective credits. Foundation requirements involve an inquiry course and a substantive core course. Students can select from classes such as legal perspectives on education, anthropology of education, or educational futures. IU also offers an online Ed.D in literacy, culture, and language education. As part of the electives, students should take six credits of classes in another department. All students complete a capstone, and students who plan to pursue a doctoral degree can choose to complete a thesis. Students in the master’s program can pursue additional certification in children and young adult literature, ESL/EFL teacher preparation, ESL/EFL teacher training, or one of several Indiana teaching license additions. Required certificate courses may also apply towards the master’s degree requirements. Online graduate students may be eligible for financial aid such as loans, scholarships, assistantships, and fellowships. Indiana residents pay lower tuition than out-of-state online students. Online graduate students can take advantage of online student resources such as the success coach, libraries, and writing support. Distance learners may also use online career support services such as resume assistance and career coaching. Students have access to 24/7 technology support. Students new to distance learning can prepare for their online courses by practicing with IU’s interactive modules. Applicants must submit official transcripts, two letters of recommendation, and a personal statement. Students with less than a 3.0 undergraduate GPA should also submit GRE scores. The school encourages new students to contact their departmental advisor before registering for classes. Prospective students should apply by March 1 for fall and summer terms or November 1 for spring term. The MA in reading education at Appalachian prepares students for careers as educators as well as reading specialists, literary coaches, and curriculum coordinators. The 39-credit program is structured in a hybrid distance education format. Hybrid courses require at least one in-person meeting with the professor, and courses may include synchronous meetings. The university states that their reading faculty is one of the largest in the region and all faculty both teach and participate in scholarly research. Students in the program can choose from two concentrations, adult literacy or the classroom/clinical track. The adult literacy track includes 18 credits in the concentration with courses such as the adult learner and adult literacy instruction. Graduates of the adult literacy track are prepared to teach and coordinate adult literacy services. The classroom/clinical track is designed for K-12 classroom teachers and requires 21 credits in the concentration. Courses include advanced study of children’s literature and a practicum and seminar in the clinical teaching of reading. All master’s in reading online students must pass a comprehensive exam during their final semester. Distance education students at Appalachian have access to academic support including library services, online tutoring, and the writing center. The student learning center offers coaching, workshops, and resources for time management and study skills. The career center also offers assistance for job applications and interviews. Online students with technology concerns can receive support from the IT support center. Applicants must submit a resume, three letters of recommendation, GRE or MAT scores from within the past five years, and transcripts. Prospective students should have a 3.0 GPA or a 2.5 minimum GPA with test scores in the 25th percentile. North Carolina residents pay significantly lower tuition than out-of-state students. Distance education students may be eligible for financial aid. The master’s in reading education is one of the many programs offered through UAB’s department of curriculum and instruction. The online master's in reading is a 33-36 credit program. Courses in the program include classes in technology standards, an internship, and the reading specialty. Reading courses focus on teaching reading and language arts, assessment, evaluation, and research. Teacher candidates learn about reading strategies for K-12 students. Notable courses in the program include dyslexia research, teaching new languages through reading and writing, and introduction to exceptional learners. To graduate, students must complete program requirements with a 3.0 GPA and pass a comprehensive portfolio review. Reading education is offered as both a master’s degree and as a certificate-only option. The master’s program is for students who have completed an undergraduate degree, have a certification, and want to earn an advanced degree in their current subject area. Certificate programs are applicable to students who already hold a degree and teaching certification in one subject and want to earn certification in a different subject. UAB eLearning programs are delivered through the Canvas platform, with technical support available through live chat, phone and a ticketing system. Distance students also have access to university support including academic advising, a math lab, the writing center, and disability support services. Since the program is designed for current teachers, students can complete all coursework online in the evenings and weekends. Master’s applicants must provide evidence of current teaching certification, two years of teaching experience, and transcripts indicating that they have completed two reading courses. Students with a teaching license from another state must hold valid Alabama Class B certification before completing this Class A program and subsequently applying for Alabama certification at the Class A level. UAB cannot currently accept Kentucky residents into online programs. Loyola Marymount, located in Los Angeles, is a private university of the Jesuit tradition that also offers online learning opportunities. The university’s MA in reading instruction is a two-year program that prepares graduates for leadership roles in pre-K-12 classrooms. It emphasizes the inclusion of technology and approaches to working with diverse populations. Comprised of 33 credit hours, this degree was created with working professionals in mind. Learners who are able to take two classes during the fall and spring semesters and one class during the summer can graduate within two years. All courses are offered asynchronously to ensure that students are able to complete assignments on their own schedules. Optional synchronous meetings are also available to students who want to enhance their LMU experience. Course topics include assessment of reading performance, advanced diagnosis and intervention in reading, and reading development and instruction. Whether a distance learner plans to work in a classroom or as a district supervisor, Loyola Marymount’s online master’s in reading provides the hands-on learning and theoretical knowledge needed to thrive in many roles. Candidates who already have a teaching credential can use the same coursework and apply it toward a reading and language arts specialist credential. While this program doesn’t require a thesis or final project, learners will need to pass a comprehensive exam to qualify for graduation. Students can begin the program in the fall, spring, or summer term. The deadlines for admission are June 15, November 15, and March 15. Located in Cambridge, Massachusetts, Lesley University serves around 7,500 students, including almost 5,000 graduate students. The institution was founded in 1909 in order to train future educators. Today, the school continues its tradition of academic excellence in the field of education by providing innovative programs such as creative arts in learning and special education. The master of education in language and literacy is one of the university’s 20 online programs. Online master's reading specialist students complete 30 credits of required courses and a three-credit capstone. Required courses include culturally responsive teaching, struggling readers and writers, and classes in assessment, literature, and linguistics. The capstone course allows students to reflect on current literacy practices in schools. Capstone students then design a professional development experience that advocates for change. Courses are structured in eight-week terms. All students pay the same per-credit tuition rate, with financial aid available for eligible students. The university offers grants and scholarships, including a graduate merit scholarship for education applicants. The school considers students for scholarships based on undergraduate GPA and the personal statement. Online students may also be eligible for loans, assistantships, and payment plans. Residents of Georgia, Kentucky, Arkansas, and Oregon are not currently eligible for Lesley’s online programs. Applicants must have a teaching license or provide evidence of education experience. Application materials include transcripts, letters of recommendation, and a personal statement. One of the two required recommendations should come from a past or present supervisor. Current students or recent graduates should include a letter from a faculty member. The 600-900 word personal statement, an integral part of the application, should address professional experience and goals. New students can begin the program in fall, spring, or summer. West Florida, located in Pensacola, offers one of the best online master’s in reading. WF is a public institution that caters to approximately 13,000 learners. Made available to licensed teachers, the school's MEd in reading education requires students to earn 36 semester hours -- all of which are tailored to the International Reading Association’s standards. The curriculum is focused on meeting the needs of today’s classrooms and students. Studies in differentiating instruction, identifying and preventing reading difficulties, and the organization and administration of reading programs help prepare graduates to be knowledgeable leaders in reading and literacy. In addition to a reading practicum requirement, students complete a research-based capstone project during their final semester. Although this program is available to out-of-state applicants, prospective students should review their state’s department of education requirements before enrolling. Applicants must demonstrate ESOL proficiency. They must also provide transcripts that show a minimum GPA of 3.0 was maintained at the undergraduate level. This program does not require applicants to have previously taught in a classroom or to have gained licensure. Degree-seekers can begin their studies at three different times per year: fall, spring, and summer. The application deadlines for each of these sessions are June 1, October 1, and March 1. Distance learners must pass teacher certification exams that cover general knowledge, professionalism, subject areas, and reading. A reading endorsement is also available to students seeking this additional credential. Northern Iowa’s online learning programs, taught through UNI at a Distance, provide many distance learning options. The school's master of arts in education in literacy education can be completed through video conferencing and the school's online learning platform. This online reading specialist degree was developed for currently-licensed teachers looking to gain further reading endorsements. Graduates may choose from three tracks: reading education K-8, secondary reading, or reading specialist. Every student is assigned to a cohort of learners whom they move through the program with, providing a traditional experience and support during the two years. Required coursework is tailored to offer the latest research and teaching methodologies, thereby putting graduates on the forefront of reading education and literacy best practices. Required coursework includes language development and variability; ideological, cultural, and sociopolitical issues in children’s literature; and advanced assessment and evaluation of literacy development. Degree-seekers also complete a practicum during their final semester and take between two and 12 units of research-based courses to prepare a thesis. Depending on the number of research units taken, this program ranges from 31 to 43 credits and can be completed in eight semesters, including summer sessions. Most semesters consist of six to nine credits. Learners undertake a practicum to qualify for graduation. For the 2017-2018 academic year, learners paid $486 per credit. The Stanley and Norma Reeves Scholarship is available to learners within this program. Concordia University’s MEd in literacy with a reading specialist emphasis prepares students to teach at the elementary or secondary level in public or private settings. Concordia’s program instills innovative, sustainable, and successful strategies for working with students of varied backgrounds and levels. In addition to covering all the theories and practices commonly seen in other programs, Concordia also focuses on how to effectively use assessment tools to create a curriculum. The program requires students to earn 36 credit hours to graduate. Courses are taught in eight week blocks, giving students the opportunity to complete the program at an accelerated pace. Courses include research evaluation and design; preliminary design and processes for a case study; and decoding, comprehension, and fluency in word study. Before being cleared for graduation, all learners must take EDUC 631: creating a case study in literacy. This field-based program requires learners to interact with students in a supervised manner while keeping reflective journals and providing a research paper on a topic or issue observed during their time in a primary or secondary classroom. Concordia offers multiple start dates throughout the year. Enrollment requirements include an application, official transcripts, a professional resume, and a 500- to 750-word essay demonstrating interest in the program and future goals. Online learners can expect to pay $550 per credit hour for this degree. Students at the UNC Charlotte campus have the opportunity to complete an innovative master of education in reading that prepares them for literacy roles in K-12 classrooms. Comprised of 33 credit hours, this online master’s in reading is taught through Moodle in a part-time format to provide flexibility. The school's master’s in reading online is taught synchronously -- meaning students will need to log-in through Saba Meeting at specific times. Classes are divided into four content areas: foundations of literacy and technology, developmentally appropriate assessment and instruction, expanding content and pedagogical knowledge, and reflective leadership. Required courses include emergent and elementary literacy, diagnostic assessment and instruction in reading, and multi-literacies in a global world: reading and writing texts in new time. Applicants must hold an A-level license from the North Carolina Department of Public Instruction or the equivalent awarding body in their home state. Degree-seekers in North Carolina will be eligible to sit for the Advanced Standard Professional II teaching license in K-12 reading education. Distance learners from other states should check with their board of education to find out if this program qualifies them for equivalent licensure. In-state learners can expect to pay approximately $8,000 for this program, while those who live out-of-state should plan for an average of $28,000. A number of assistantships are available to help offset these costs. Distance learners seeking higher education after completing this accredited online reading specialist degree can enroll in UNC’s PhD in curriculum and instruction with an emphasis in reading education. Founded in 1944 as Pacific Bible Institute, FPU now offers 39 undergraduate majors and over 40 graduate programs. The university currently maintains five locations in California and an online campus. The 31-credit master of arts in reading and language is not a fully online program, but does offer evening, blended, and online course options. Online courses are delivered through the Moodle platform. Graduates of the program receive both their master’s degree and a reading certificate, which can also be pursued separately. Courses in the program include multilingual learners, trends in literacy and language, assessment and evaluation, and research. Class sizes are small. All lessons can immediately be applied in the educator’s classroom. The program offers summer residencies, which are ideal for working educators. These residencies allow students to complete the program more quickly. Graduate students at FPU gain access to technical support, career services, libraries, and academic advising. True to its Christian background, FPU also offers support for students’ spiritual life. The school assigns a dedicated student success coach to each online student. Students interested in the online master's in reading may also be interested in FPU’s online MA programs in curriculum and instruction, educational technology, and school library and information technology. Online students may also pursue a teacher librarian services credential for California. Applicants must submit their teaching credential along with transcripts, a statement of intent, writing sample, and three letters of recommendation. All potential students undergo an interview. While graduate applicants must usually have a 3.0 GPA, students with lower grades can submit standardized test scores with their application. Students can apply to begin the program in fall or summer. All students in the teacher education programs pay the same per-credit tuition rate. The school encourages distance learners to apply for financial aid. Chicago’s Concordia University, a private institution, offers a master of arts in reading education degree online. The program emphasizes a theoretical and practical framework that's needed to excel in literacy instruction and assessment, as well as current research in the field. Concordia’s accredited online reading specialist degree is designed for individuals who desire teaching literacy careers. Graduates have the tools, knowledge, and wisdom they need to serve students and become leaders in the field. The program requires students to earn 30 credits and can be completed in 24 months. No GRE scores are required. Students are required to spend a semester in a classroom gaining real-world experience before creating a culminating project that uses all the skills they’ve built throughout the program. After completing required coursework and a reading specialist exam, degree-seekers are eligible to apply for the Illinois Reading Specialist credential. Distance learners from other states need to check with their board of education to ensure this program meets the requirements for similar certification in their state. The curriculum covers an array of current topics, including the assessment of reading with remedial materials, content reading for middle and secondary schools, and foundations of language and reading theory. The practicum is focused on using developmental instruction and support. Applicants matriculate during the fall semester, and the application deadline is August 21 for domestic and international students. A number of departmental scholarships are awarded on the basis of need and merit. The MA in curriculum and instruction: reading and writing is a new online program at CU Denver, joining other online education master’s degrees in math and science, early childhood education, eLearning, and school library. The reading and writing program helps working educators teach literacy in the current educational climate, which includes more diverse populations of students. About 95% of program participants work full-time while completing two classes per semester. On that schedule, students can complete the 30-credit program in five semesters. Students who choose a heavier course load can complete the program in one year. The curriculum includes three concentration courses, five course inventories, one research class, and one capstone. Courses focus on teaching reading and writing to diverse learners with courses covering development, assessment, and language acquisition. At several points in the curriculum students can choose between courses that focus on teaching elementary or secondary learners. Classes are delivered through the Canvas platform. Master’s students choose from one of two program tracks. One track focuses in reading and writing while adding a Colorado Department of Education endorsement to a teaching license. The second track includes a 15-credit concentration in reading and writing and allows students to customize the other half of the program. The customization track does not lead to an endorsement. Instead of immediately starting the master’s program, students can choose to earn a reading specialist certification online and then move into master’s courses. Some school districts partner with the language and literacy program to offer hybrid certificate. Out-of-state online students pay slightly higher tuition than Colorado residents, but pay less than half of what they would be charged as an on-campus student. The school also offers six scholarships a year to students in the reading program. Students may qualify for a federal TEACH grant. Mason Online offers more than ten online and hybrid curriculum and instruction degrees, including several advanced studies in teaching and learning (ASTL) programs. The ASTL concentration in literacy: reading specialist is a 33-credit master’s program that consists of 12 credits in ASTL and 21 credits in literacy. ASTL core classes include education and culture, educational change, and assessment in learning. Literacy courses include courses focused on teaching literacy to various ages and diverse populations. Students also complete a supervised practicum course. This hybrid program offers 75% of courses online. In-person courses are offered at all three Mason locations, generally in the afternoon and evening. Full-time students can complete the program as quickly as two years. Students who complete the reading specialist certification online program are eligible for licensure as K-12 reading specialists. Students who already hold a master’s degree may be able to complete the K-12 reading specialist component as a graduate certificate. Online students with technical issues can seek help from the ITS center. Distance learners can access all the Mason libraries online, or chat with a librarian through phone, email, or instant message. Online student tuition is charged per-credit, with Virginia residents paying lower tuition than out-of-state students. However, out-of-state graduate students in the College of Education and Human Development receive a special tuition discount, paying 40% less than other out-of-state graduate students. GMU accepts applications on a rolling basis. Prospective students should submit transcripts, three letters of recommendation, a writing sample, and a goals statement. Applicants should have a 3.0 GPA in their last 60 hours of undergraduate study. However, students who do not meet the GPA requirement may still be accepted in certain situations. Prospective students should also have at least one year of teaching experience. SRU offers three undergraduate and three graduate degrees in elementary education, with all graduate degrees offered online. The department of elementary and early childhood education is accredited by both the Council for the Accreditation of Educator Preparedness and the Pennsylvania Department of Education, ensuring that all programs meet high standards. SRU’s Elementary Education graduate Reading programs are accredited by the International Literacy Association. Graduates from the master of education in elementary education K-12 reading specialist degree obtain careers as literacy coaches, study skills specialists, and K-12 reading teachers. The master’s program with certification as a reading specialist requires 30 credits. The curriculum includes core courses, education foundations, and research and statistics. Students can also choose to add an instructional coaching endorsement with a literacy emphasis to the degree. The master’s with both the certification and endorsement requires 33 credits. Future educators may choose to pursue the instructional coaching endorsement or the reading specialist certification independently from the master’s program. Without the master’s, the coaching endorsement requires 12 credits to complete, the certification requires 21 credits. Students must pass the Praxis II reading test in order to obtain the reading specialist certification. Classes are small, with student receiving individual attention from faculty. Tuition is similar for in-state and out-of-state students, with Pennsylvania residents paying slightly less per credit. Financial aid includes grants, loans, and institutional scholarships and fellowships. Program applicants should have a 3.0 minimum GPA. Candidates must submit transcripts, a resume, two letters of recommendation, and proof of teaching certification or evidence that the certification is in process. One reference should be academic while the other reference should be professional. The program’s graduate coordinator may also recommend students who fall below these minimums for conditional admission. Practicums and field experiences require students to pass multiple background and record checks. Ball State Online offers more than 70 degree, certificate, and licensure programs. Online students receive the same resources as students on-campus, starting with the online orientation. The learning center provides tutoring through video workshops and web-based tutorials. Distance learners can contact the writing center through email and phone or schedule an individual online session through Skype. Technology help is available through chat or phone. The career center provides an online career search tool, career coaches, and online videos to help students with resumes, interviews, and job searches. Online courses, delivered through the Blackboard platform, are mostly offered asynchronously. Synchronous classes are generally taught after 6 PM. The master of arts in education with a focus in reading-literacy instruction is one of the school’s many online master’s degrees in elementary education. The fully online, 30-credit curriculum includes 15 credits of core coursework and 15 credits in the reading-literacy focus. Reading-specific courses include classroom reading diagnosis, integrating technology in the literacy program, history of reading, early literacy, and school reading programs. Teacher candidates also learn how to teach literacy to diverse learners. Graduates are eligible for a literacy instruction certificate. Students may also pursue certification separately from the master’s program. Applicants to the master's in reading online program must first be accepted by Ball State’s graduate school, and then by the individual department. The graduate school requires undergraduate cumulative GPA of 2.75, or a 3.0 GPA earned in the last half of the undergraduate degree. While Ball State Online programs are available to students in all states, students in education programs should check with their state department of education to ensure their degree will be approved for licensure, certification, or career advancement purposes. The master of education in reading program the University of Texas at Tyler offers preparation that leads to certification as reading specialists and master reading reachers in PreK-12 settings. The 30-credit graduate online degree program, along with its associated certificates, is designed to provide candidates with opportunities to build specialized knowledge, engage in evidence-based literacy practices in supervised school settings, and prepare for literacy leadership roles in schools. The MEd-Reading program provides a balance of coursework and field experiences enabling students to use and apply what they learn in real-world school settings. It addresses new and emerging media literacies and prepares reading professionals in various roles to address the language, literacy, and content needs of all students, including English learners. Candidates also learn to serve as literacy leaders who can work effectively, not just with students in classroom settings, but also with fellow teachers, parents, and school administrators. UT Tyler’s MEd-Reading program is offered online and has around the clock support systems in place. This provides practicing teachers maximum flexibility. Applicants should hold a bachelor’s degree from a regionally accredited school, and have teacher certification; applicants outside of Texas must provide evidence of their certification. Prospective students must also submit GRE scores (applicants with a GPA exceeding 3.25 are exempt from this requirement) and have earned a GPA of at least 2.50 as an undergraduate. With classes such as reading and writing connections, literacy for the diverse learner, and organization and management of school literacy programs, the master of education reading: reading teacher added endorsement program at Regis educates teachers on the current best practices in literacy education. This online program is offered asynchronously and is specifically designed for working educators. Through eight-week online terms, students can complete the fast-paced degree in less than two years. The 30-credit online reading specialist program includes 27 credits of required courses and a three-credit practicum or capstone. Licensed educators in Colorado and Wyoming are eligible for the reading teacher endorsement. There are two other options as well: the reading specialist endorsement, for Colorado educators only, and the non-endorsement option, which is open to licensed educators in any state. Students who choose one or more of the endorsement options must complete a practicum, usually in their own classroom. Non-endorsement students complete a capstone project. Students can begin the degree in August, January, or May. Applicants should submit their resume, a copy of their teaching license, an essay, and transcripts. Prospective students should have a minimum cumulative GPA of 2.75. Students should have two years of teaching experience by the time they complete the program. All distance learners pay the same per-credit tuition. In addition to financial aid such as grants, scholarships, and loans, all K-12 teachers and paraprofessionals are eligible for a 10% tuition discount. Regis University offers more than 130 degrees. Nearly 80 are available online, including 10 education master’s degrees. The university also offers several reading-related education certificates, including a 12-credit online literacy graduate certificate and a linguistically diverse learner 12-credit certificate. UW’s La Crosse campus has been providing public education for more than 100 years. The institution’s reading specialist degree online was created with working teachers in mind, specifically those who have already been in the classroom for at least one year and have completed licensure requirements. A foundation of best practices and current literacy research makes this program a popular choice with educators, as does the opportunity to earn a reading teacher or reading specialist license. The curriculum is among online reading master's programs built around the International Literacy Association’s standards for reading professionals. It focuses on six different categories of learning: foundational knowledge, curriculum and instruction, assessment and evaluation, diversity, literate environments, and professional learning and leadership. The reading teacher certification master’s comprises 30 credits, while the reading specialist certification master’s requires 37 credits. For learners who aren't seeking certification, a different 30-credit program allows students to use their electives to study advanced topics in literacy or teaching English to speakers of other languages (TESOL). Core courses include critical issues in reading difficulties, children’s and adolescent literature, and directing a school-wide reading and literacy program. Taught as a cohort program, students enter the program with a group of peers who take the same courses for the duration of the degree. New students are only accepted in the fall of each academic year. Applicants must have completed an appropriate baccalaureate degree, be certified or licensed as a preK-12 teacher, and have at least two years of teaching completed at the time of application. To become certified, degree-seekers must complete a thesis, a portfolio, and earn a passing score on the Foundations of Reading exam. The University of Cincinnati, offering one of the best master’s in reading online, is a public institution located in southwest Ohio. The online master’s in literacy and second language studies was developed for educators who aspire to work with diverse populations, including traditional K-12 school settings and adult literacy programs. The degree offers a range of specializations, including pre-K-12 literacy learning and instruction, pre-K-12 teaching English as a second language, and adult/international teaching English as a second language. Within each of these areas, learners complete a semester-long practicum at a local school or learning center and submit a comprehensive research paper during their final semester. Other coursework requirements include foundations of first and second language learning, literacy as a linguistic and cultural tool, and sociolinguistics and bilingual education. Graduates have gone onto roles as PreK-16 literacy learning instructors, developmental reading instructors, ESL educators, curriculum developers, and international teaching English to speakers of other languages (TESOL) educators. Applicants must have a minimum 3.0 GPA. GRE or MAT scores are also required. Other materials that should be submitted include official transcripts, letters of recommendation, and a personal statement. Distance learners applying to the PreK-16 literacy and learning path are encouraged to have at least two years of teaching experience before they apply. International degree-seekers may be required to meet additional application requirements. Students with prior graduate credits from a different institution may be able to apply for credit transfer if they meet course equivalency requirements. While each school's online reading master's program features curriculum dependent upon different course requirements and offered concentrations, most programs consistently cover a similar spread of content relevant to reading literacy careers. Below is a list of some of the types of courses that programs tend to offer. Foundations of Reading: This course aims to provide students with the background knowledge necessary to understand developmental levels and theory as it relates to reading comprehension at the elementary and secondary levels. Content in this course is geared toward K-12 reading specialists and teachers, and may examine how cultural, linguistic, and ethnic diversity affect reading literacy and growth. Research in Education: Skills used to analyze education research papers are typically utilized in this course. In discussing research methodologies, students who hope to pursue careers in education leadership will develop their ability to comprehend and critically analyze research articles as they pertain to reading literacy at all levels of education. Literacy for English Language Learners: This course focuses on how to effectively teach English Language Learners (ELL) and how to create a supportive learning environment for students of different linguistic backgrounds. Topics within this course often cover the process of first and second language acquisition, reading and writing development for ELL students, and optimal instructional approaches. Literacy Coaching: Participants enrolled in this class learn the ins and outs of being a literacy coach. The curriculum often covers theories around language development as well as coach and teacher collaboration. Students enrolled in a literacy coaching course or concentration should be prepared to study coaching practices and observe a literacy coach in a school. Professional Learning and Literacy Leadership: This course teaches students key leadership skills that they can use to excel as a reading specialist or literacy coach. Coursework and discussions provide students with examples of how to collaboratively create and lead literacy programs at the individual, classroom, school, and district-wide level. HOW LONG DOES IT TAKE TO GET AN ONLINE MASTER'S IN READING LITERACY? Online reading master's program take varied amounts of time to complete depending the school and program requirements. Length of completion time depends on whether or not an online degree can be taken at an accelerated pace, if students take courses synchronously or asynchronously, if certain concentrations within the degree require more credits than others, and how many total credits are needed to graduate. In some cases, students are assigned classes with a cohort so that all participants who start the program at the same time will take classes and graduate together. Other online master's in reading literacy programs, however, let students go at their own individual pace, providing them the flexibility to complete classwork whenever it works best for their schedule. In these cases, students often take classes on a part-time schedule so they can continue working. On average, it takes about 36 credits, or two years, to graduate from a reading specialist degree online program. Reading Specialist Certification: This certification, which confirms that a teacher has training in reading literacy, varies in requirements from state to state. In general, reading specialists must hold a valid teaching certificate, previous teaching experience, a master's degree with a concentration in reading and writing education, and substantial field experience. English Language Learner License: This license enables licensed teachers with bachelor's degrees to focus their teaching on ELL instruction. Like the Reading Specialist Certification, the ELL License varies in requirements from state to state, but the vast majority of states require students to engage in a practicum and pass a ELL instructor exam. Literacy Coaching Certification: This certification, which is often offered through online master's in reading literacy programs, prepares licensed teachers to grow in literacy leadership roles at the individual, school, or district level. Those who earn this certificate must often complete additional courses and gain field experience on top of the standard online master's in reading degree requirements. In considering online reading master's programs, be sure to verify that a school is accredited. Institutions with accreditation demonstrate that they meet education standards set by a board, organization, or government. It is most common to see schools accredited regionally by organizations such as the Commission on Colleges of the Southern Association of Colleges and Schools, the Western Association of Schools and Colleges, or the New England Association of Schools and Colleges, among others. These regional accrediting agencies are held to specific standards by the U.S. Department of Education. Within the field of education -- and more specifically for reading specialist certification online programs -- reliable online learning programs will be connected to the Council for the Accreditation of Education Preparation. This organization creates standards to ensure educator preparation institutions are providing adequate knowledge and skills to support future teachers. It is a sign of good education standards for Master's of Education programs to be connected to this council. To confirm if a school is accredited by a legitimate organization, U.S. Department of Education has a searchable database of accredited postsecondary institutions and programs — a reliable way to check if certain online learning programs are sources of quality education. Reputable online universities can be found through this database, including schools that offer online reading master's programs. The Council for Higher Education Accreditation (CHEA) is another trustworthy source to confirm if a school meets educational standards. The council is composed of 3,000 degree-granting colleges and universities and recognizes 60 institutional and programmatic accrediting organizations. Their work is vital to upholding and ensuring quality education standards. You can find a list of all accredited schools through the U.S. Department of Education or CHEA.